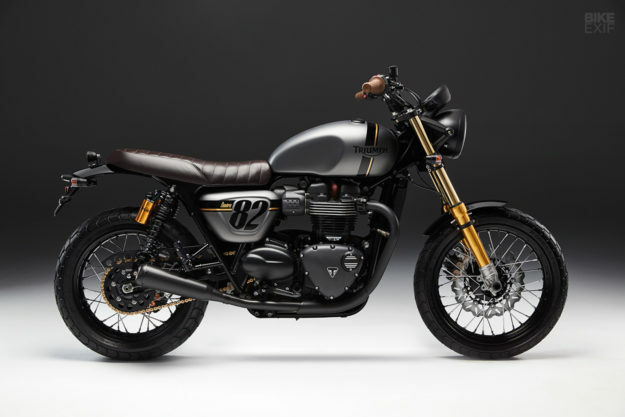 The pre-2016 Triumph Bonneville is one of the shining stars of the custom scene: a bike that only gets better as you tweak it. And you don’t need a grinder, even for a fairly heavy custom job—there’s a huge network of aftermarket parts suppliers. 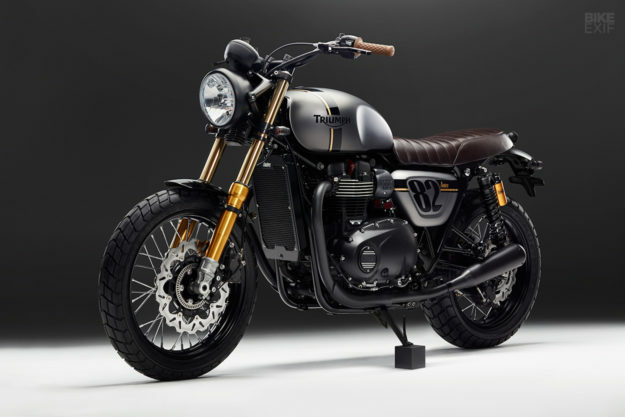 The bestselling model in the Modern Classics range is now the ‘new’ liquid-cooled Street Twin. But will it respond to subtle mods as well as its illustrious predecessor? This new low-key build from Bunker Custom Cycles suggests the answer is a resounding Yes. Istanbul-based brothers Can and Mert Uzer are capable of very extensive custom work, but that wasn’t on the cards for this project. 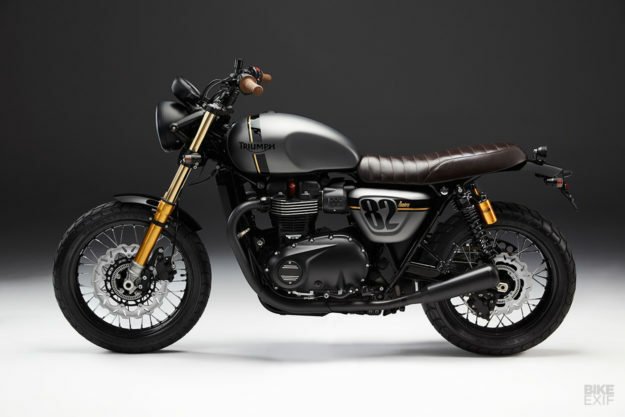 Their client simply wanted a handsome Triumph classic with a matte paint job. And since the Street Twin is the most affordable modern classic in Hinckley’s stable, the Uzer boys picked one up and got cracking. Bunker’s style is marked by good design and impeccable taste. It’s no surprise, given that one brother is a top skateboarder, and the other has a background in digital advertising. So this Street Twin’s stance, proportions and livery are all top shelf. It’s a bit of a sleeper too, with upgraded suspension propping it up at both ends. The front end’s a plug and play kit from Canyon Motorcycles, which includes Öhlins 43mm FG 621 forks, and a set of CNC machined triples. Bunker deliberately opted for right-side-up forks, citing their classic look as an overriding factor. There’s a set of Öhlins TR 964 shocks out back too, raising the ride height by an extra three centimeters. 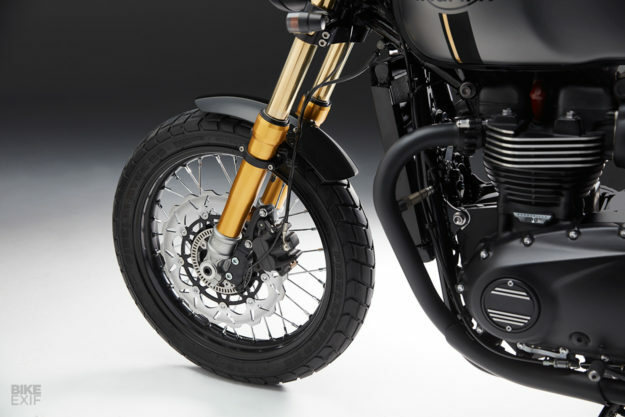 The spoked wheels are from Triumph’s own catalog; they’re an optional upgrade for the Street Twin’s OEM alloy numbers. 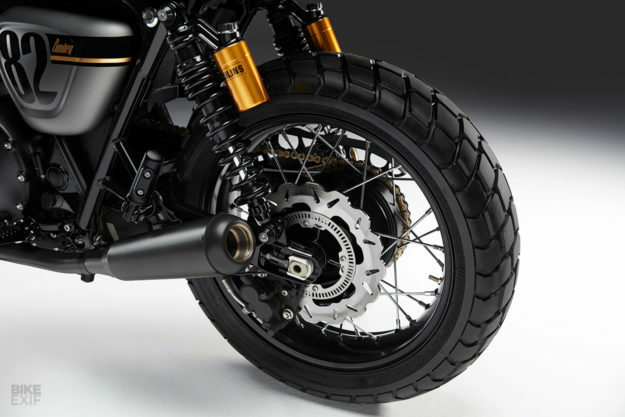 Bunker have wrapped them in Pirelli MT60 rubber, adding a small measure of dirt road ability to the Street Twin. And they’ve upgraded the brakes too, with Galfer discs and pads. Up top, the guys shortened the subframe by 10 centimeters, then set about building a new seat. It’s been shaped on an aluminum seat pan, with a gel insert and a brown leather cover, stitched in a classic tuck-and-roll pattern. Out back, they fabricated a new aluminum fender—then re-used and modified the OEM license plate holder. There’s a new LED taillight, along with a new set of turn signals. 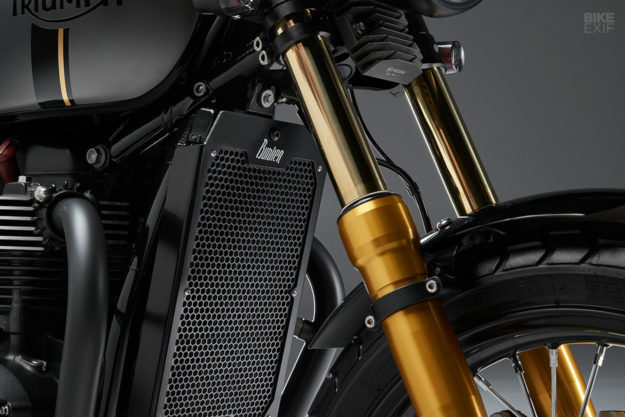 The new front fender is another custom-made piece, and is mounted to the brackets that came with the front-end kit. TEC Bike Parts also came to the party with a number of tasty upgrades. They supplied new mufflers, along with a nifty catalytic convertor eliminator. 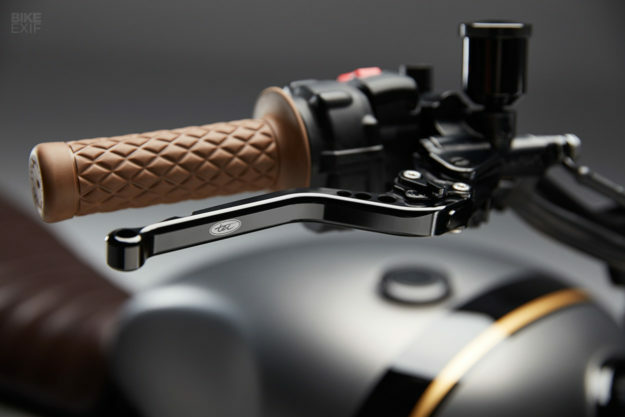 The handlebars, handlebar clamps and adjustable levers are from their catalog too. 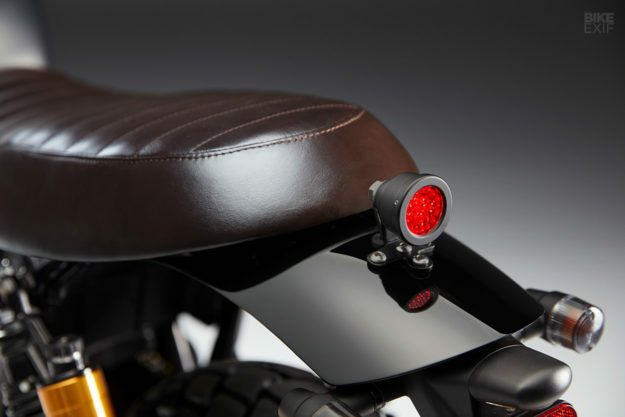 They’re matched to a set of brown Biltwell Inc. grips—but the switches, speedo and headlight are all stock. This Street Twin’s also sporting a couple of Triumph catalog parts—like the inspection and ignition covers—along with a chain guard from British Customs. The new radiator guard’s a Bunker part, and is actually for sale via their website. There are also a few choice upgrades hiding under the hood. Bunker left the Triumph’s air box intact, but installed a K&N filter and crankcase breather. Then they wired in a new Unibat Lithium-ion battery, and added a Dynojet Power Commander 5 fuel injection module. The bike’s been professionally tuned now, and reportedly pumps out 63.4 hp—almost 10 horses more than stock. 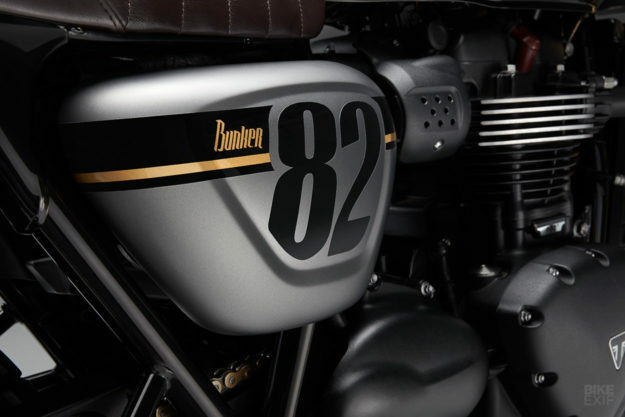 Then there’s Can’s tasty paintwork—a combination of matte silver with gloss black and gold touches. 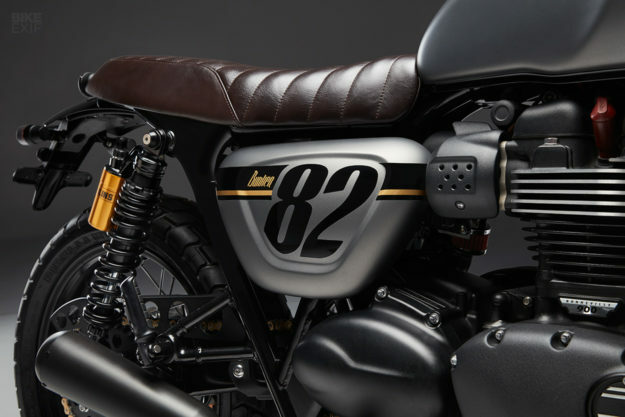 The minimalism is supremely well judged, and gives this Triumph that better-than-factory vibe that Bunker excel at. Oh, and it’s a bit lighter too now. Bunker went to the trouble of weighing every part that came off and went on, and reckon they’ve shaved off almost 12 kilos (25 pounds). More power, plusher suspension and less heft sounds like a winning combo to us. 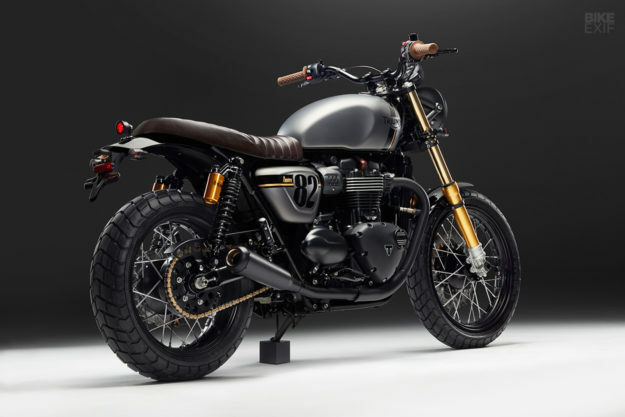 Who else reckons the Street Twin has a bright future? Bunker Custom Cycles would like to thank Tec Bike Parts, Galfer Discs and Evans Coolants for their support.